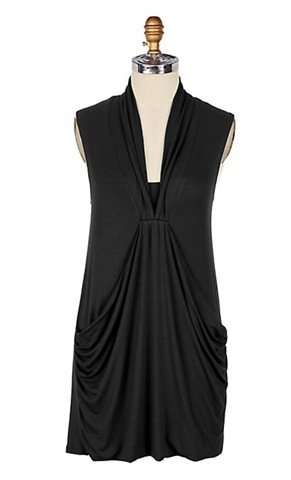 The draping and shape is so fun and comfortable. it hides all flaws and still adds a great shape. The fabric just flows and moves when you move, so it feels free, while you don’t have to feel so self conscious. It’s more like a tunic rather than a top, so you can even wear it with leggings and flats for a more casual look, or you can dress it up with accessories for a night out. the dress is very versatile. I’m 5’2, so I can even get away with wearing it as a mini dress. LOVE this dress so much and basically wear it everywhere because it’s so casual and comfortable, but everyone thinks I’m dressed up, so it’s pretty versatile.